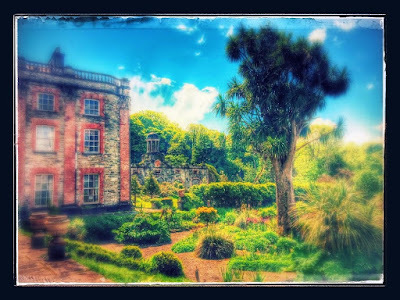 Before a long weekend in Bantry, Co Cork, came to an end, two of us visited Bantry House and Garden which overlooks Bantry Bay on the Wild Atlantic Way. The house and garden are open during the summer season from 25 March to 30 October, and stand above the Maritime Hotel, where we were staying for the weekend, looking out onto Bantry Bay, Whiddy Island and out onto the Atlantic Ocean. Bantry House is now owned by the Shelswell-White family, and has been the home of the White family and the Earls of Bantry since about 1765. The house was originally called Blackrock and was built ca 1700 on the south side of Bantry Bay. The first house was owned by the Annesley family, Earls of Anglesey, who leased it to two or more generations of the Hutchinson family. In 1750, Richard White of Limerick, who by then owned Whiddy Island, bought Blackrock from Samuel Hutchinson and changed the name to Seafield. The Whites had been merchants in Limerick before they settled on Whiddy Island across the bay in the late 17th century. As they prospered, the White family bought considerable tracts of land in the area around the house. Richard White had an only son, Simon (1739-1776). In 1766, this Simon White married Frances Jane Hedges Eyre (1748-1816) of Mount Hedges, Co Cork, daughter of Richard Hedges Eyre and Helena Herbert of Muckross, near Killarney, Co Kerry. Simon and Frances White had two sons, Richard White (1767-1851) and Simon White (1768-1838). Richard White would inherit the Bantry estates and become the 1st Earl of Bantry; the younger son, Simon White, married Sarah Newenham. They lived in Glengarriff Castle, Co Cork, and had four children. By the 1780s, the lands around Bantry House came to 320 sq km (80,000 acres), although much of this land was not arable. In 1796, Theobald Wolfe Tone and the United Irishmen attempted to land a formidable French armada, commanded by Admiral Hoche, in Bantry Bay. The armada included 50 naval warships and 15,000-strong force. Richard White had heard rumours of the invasion plans and he raised and trained a loyal militia, mainly from among his tenants on the Bantry estate. He stored arms and munitions in Bantry House, and posted look-outs on both Mizen Head and Sheep’s Head, the furthest seaward reaches of Co Cork, to warn of an imminent invasion. However, the weather was so severe that ship-to-ship communications were almost impossible, and the fleet eventually returned to Brest in France. Ten ships sank in the Atlantic waters, and the Surveillante, which was scuttled off Whiddy Island, remained on the bottom of Bantry Bay for almost 200 years until 1982. Four guns in front of Bantry House look out onto Bantry Bay. The two smaller ones are six-pounders, made at the Carron Works in Falkirk in 1780. The larger, twelve-pounder is dated 1795 and was made at the Clyde ironworks near Glasgow. The gun stamped A4RP is French and was made at the Rouelle foundry in 1795. It may have been captured from the Surveillante before it was scuttled off Whiddy Island. Richard White was rewarded for his loyalty during the 1796 invasion when he was made Baron Bantry in 1797. Two years later, in 1799, he married Lady Margaret Anne Hare, daughter of Viscount Ennismore, later the 1st Earl of Listowel. They had four sons and a daughter who died in infancy. In 1801, the title was advanced from Baron Bantry to Viscount Berehaven, and in 1816 Richard was made 1st Earl of Bantry. In the same year, he donated the site for a new Church of Ireland parish church in the centre of Bantry. His eldest son, also Richard White (1800-1868), married Lady Mary O’Brien (1805-1853) of Dromoland Castle, Co Clare, daughter of William O’Brien, 2nd Marquis of Thomond. From the 1820s, Richard and Mary White travelled throughout Europe. They visited Russia, Scandinavia, Spain, Italy and France, collecting furniture, paintings, tapestries and artefacts, most of which are still on display in Bantry House today. In 1851, Richard White succeeded his father as the 2nd Earl of Bantry. His father had started modest additions to Bantry House, but while he was still known as Lord Berehaven, Richard White began framing his grand visions for the house and gardens, so that the gardens we see today are mainly his creations. He appreciated his good fortune in inheriting these titles and this estate, and laid out the gardens with seven terraces to complement the bay overlooked by his house. Richard also added the wings to the house and the library, as well as a grand conservatory – which has long disappeared – facing the Hundred Steps. The two stable yards flanking Bantry House and five gate lodges were also built during his time, although only one gate lodge survives. The gardens at Bantry House were developed by the 2nd Earl of Bantry and his wife Mary, who were inspired by their travels around Europe. The gardens contain seven terraces, and Bantry House is located on the third terrace. Behind the house, the Hundred Steps are built so they appear to rise out of a fountain and they are surrounded by azaleas and rhododendrons. Bantry House has been open to tourists since 1946. Since about 1990, bed and breakfast accommodation has also been available at Bantry House. The fountain within the parterre, surrounded by Wisteria Sinenis and Wisteria Floribunda, dominates the southern aspect to the house, as do the Hundred Steps leading up to the woodland. Richard White designed the terraces to be grassed over, with phoriums placed intermittently. They were bound with balustrades, with pots on top of each plinth. It was an architectural statement inspired by the gardens he had seen in Italy. The north terraces, with their 14 round beds, are flanked by statues and pots the 2nd Earl of Bantry brought back from his travels. Visitors to the house are greeted by the statue of Diana the Huntress. Some of the statues are copies of sculptures by Antonio Canova, others are copies of classical works. In the middle of the first terrace is a rare 19th century copy of the Warwick Vase, made from Coade stone. During the Famine Years of 1840-1860, major works were carried out on the demesne. The 2nd Earl also sat on the Conservative benches in the House of Lords as an Irish Representative Peer from 1854 to 1868. Richard and Mary White had no children, and when Richard died in 1868, the family titles and estates passed to his younger brother, William White (1801-1884), 3rd Earl of Bantry. Until then, he had lived at Macroom Castle, which he had inherited from his great-uncle, Robert Hedges Eyre. William, White, 3rd Earl of Bantry, married Jane Herbert (1823-1898) of Muckross House, Killarney, and they had five daughters, Elizabeth, Olivia, Ina, Jane, and Mary, and one son, William White (1854-1891). He was an Irish Representative Peer from 1869 until his death in 1884. As the only son, William White became the 4th and last Earl of Bantry in 1884. In 1886, he married Rosamond Petre, who died in 1942. They had no children and when William died in 1891 the family titles became extinct. The estate passed through his eldest sister, Lady Elizabeth (1847-1880), wife of Egerton Leigh of High Leigh, Cheshire, to their son, Edward Leigh (1876-1920). In 1897, he became Edward Leigh-White. However, by about 1900 Richard White’s original plans for the gardens at Bantry White seem to have been forgotten. Instead, the terraces were planted with Rhodedendron Ponticum and Luteum. Over the years that followed, many self-seeding willows, myrtles and scrub would take hold in between the rhododendrons. The vegetation grew much too tall, obscuring the house and totally changing the layout and initial plan of the gardens. Meanwhile, in 1904 Edward Leigh-White married Arethusa Hawker (1885-1959) of Longparish House, Hampshire. They had two daughters, Clodagh (1905-1978) and Rachel (1906-1987). Edward Leigh-White died in 1920, and was succeeded by his eldest daughter. Clodagh White married Geoffrey Shelswell (1897-1962) in 1926 and they also incorporated White into their name. During the Irish Civil War in 1922-1923, the Cottage Hospital in Bantry was destroyed by fire. Arethusa Leigh-White offered Bantry House as a hospital to the nuns of the Convent of Mercy, who were running the hospital. Arethusa only made one proviso: that the injured on both sides of the conflict should be cared for. A chapel was set up in the library and the nuns and their patients moved in for five years. In 1926, Clodagh Leigh-White came of age and assumed responsibility for the estate. Later that year, she travelled to Zanzibar, Africa, where she met and married Geoffrey Shelswell, then the Assistant District Commissioner of Zanzibar. During World War II, Bantry House and the stables became a base for the Second Cyclist Squadron of the Irish Army. There are two plaques on the north wall of the house in memory of the men and the officers of the Royal Canadian Air Force who died when their plane crashed into the sea off the Fastnet Rock. In 1946, Clodagh and Geoffrey Shelswell-White opened the doors of Bantry House to the public. Geoffrey died in 1962 and Clodagh lived in the house on her own, until her death in 1978. Clodagh and Geoffrey Shelswell-White had three children, Delia (1928-1990), Oonagh (1930-2006) and Egerton (1933-2012). Bantry House was inherited by their son, Egerton Shelswell-White. In 1997, the extensive archives of Bantry House were donated to University College Cork, and a year later, in 1998, Bantry House hosted the first West Cork Music Festival. But by 1997, parts of the grounds of Bantry House and the gardens were suffering neglect. An EU grant helped start a restoration programme, and although funding came to an end in 2000, the restoration work continues. In 2001, archaeologists from the University of Ulster found a mediaeval Gaelic village and a 17th century deserted English fishing settlement on the west lawn of Bantry House. In 2010, Sophie Shelswell-White became the General Manager of Bantry House. Her father died in 2012, and Sophie now manages the estate with her mother Brigitte, her husband Josh, and her brother Sam. In 2011, the west stable was made safe with assistance from the Heritage Council, and there are hopeful plans to restore it in the near future. Earlier this year, in March 2016, work began on cleaning out the terraces and the next step is to refine the clearings, reinstate the balustrades, with no plant being allowed to grow higher than four feet. No pesticides are used where possible, and there are plans too to restore the Woodland walks and to make them more accessible, including the ‘Old Ladies’ Walk’ leading to the top of the Hundred Steps.